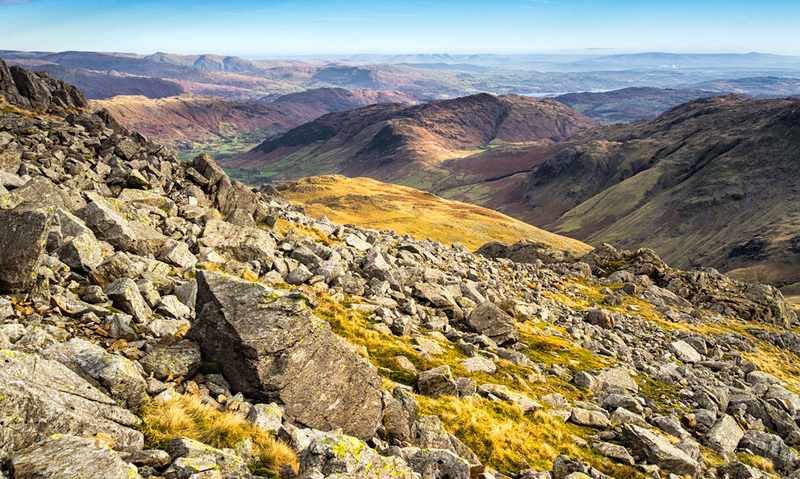 View whilst ascending Bowfell, The Lake District. I recently blogged about my new lens, the new Panasonic 14-140. I wanted the lens so that I didn’t have to keep changing lenses (between my 14-45 and 45-200) when out walking in the hills. The only problem I have found is that I don’t trust the 14-140 given the results I have had. In my previous post I mentioned that it seemed OK in the 14-45mm range but less sharp than my 14-45 lens. Beyond this I thought the poor results were from my sloppy technique – NOT SO. Having had the lens on a tripod it’s still very soft, has poor contrast and even makes the images look grainy. I ran through a batch of images that I had shot with the lens and nothing over 80mm was sharp – not one. Between 45 and 80mm the image quality was generally poor. Between 14-45 the quality was acceptable but not good. This is not a travel lens or a replacement for the other two when weight is an issue. I suspect there may be some of you reading this who are screaming out that this is an excellent lens but I have talked to a few people now who have this new Panasonic lens and all have thought it quite soft. It might be that I had a bad sample but I don’t want to risk it so I have asked for a refund. As I left it a few weeks before trying out the lens and reporting it I am out of the refund period so the retailer will only issue a credit note. This isn’t a problem though as I have my eye on a Sony RX10. I have to own up and say that this for me is exercising the ghost of a perfect camera, the Sony R1. I had one of these a few years back that I had purchased second hand. For those of you who aren’t familiar with the R1, it was a bridge camera with a fixed lens. It weighed slightly less than an SLR and was only slightly smaller. It had a 10Mpixel CMOS sensor but coupled with an astonishingly good Zeiss lens. The lens was the equivalent of a 24mm – 120mm and was amazingly sharp and distortion free throughout the zoom range. The results from this camera were amazing. When I look at the RX10, it looks very similar to the R1. It has the same huge Zeiss lens but this time goes from 24-200mm and is f/2.8 across the entire range. This is enough to convince me that I have to have one. No doubt I will dissatisfied in some way but at least I will have it out of my system. Interesting to hear your findings Robin. I was tempted by the new 14-140 as an all-in-one travel lens, but your experiences have put me off. I will stick with the 14-45 which (as you know!) is excellent, and I have also been very impressed with my Pana 45-150mm. I still have my eye on the Olympus 12-40 f/2.8 though… one day! Incidentally, how do you like the 14mm? I had to return a couple of bad samples at first, but the one I now have is very good (not better than the 14-45, but very compact and fun to shoot with). I ended up returning my Olympus 12mm as it had an AF issue on my GH2 (and terrible field curvature). I used to have the Pana 7-14mm and it was pretty awesome, but I stupidly sold it a few months ago due to lack of use. So now I have decided to buy another (used) 7-14mm, which I should receive this week. Fingers crossed that it will be a good one. Hi Ed, treat the new 14-140 with care. It may marry up to the GH2 better than the EM5 or it may be that I had a bad sample. As for the 14mm, it’s excellent. It’s on a par with the 14-45 but I love the compact size and also the way using a prime lens makes you explore the scene. Good luck with the 7-14. I remember the results were amazing when I tried it on the GX1. The only thing (other than the price) that put me off was that I couldn’t use filters. Let me know how it goes. Sorry to hear about your dissatisfaction with the 14-140 lens Robin. By the way, was that the new version or the original version? Mine was the original version and I believe there were some optical changes to the newer model. Although your applications are probably more demanding than mine, I can honestly say it performed well for me. Even though my imagery may not always demand it, I do take lens performance very seriously and do take the time to thoroughly test each lens I buy, but then again, I wasn’t shooting gorgeous landscapes such as yours either. Hi David, it was the new model of lens. I suspect like most things that are “improved”, it’s gone backwards. Just like the original Panasonic kit 14-45 lens is still hard to beat for that focal length. There seems to be a lot of variation between lenses these days also so your comment about testing all lenses is very good advice. Robin, I am concerned for you. The Sony RX10 may be the ‘perfect camera’ and what you should have bought in the first place. But the clear evidence is that it will not get anything ‘out of your system’. You have the eye and the skills to get a masterpiece out of a 3 meg phone-camera, so why don’t you & then write a book about it? When Amazon sends you the first £1,000 (! ), you can buy your RX10 Mark 2, and have experienced the cure for your GAS. P.S. I want one too! If only it were that easy. To be totally honest, I am hoping the 24-200 lens is the perfect focal length for my hiking and walking trips. If it matches to my over the top expectations I will be happy. If not I may turn to my camera phone as you suggest. Re using filters on the 7-14mm – I came across this solution while searching for a workaround for using filters on my Samyang 7.5mm: https://www.flickr.com/photos/84891527@N00/sets/72157633303317819/with/8587767394/ Not tried it yet but I am getting the bits together to test it out (A series filter holder, Kood A series filter/s and cheap rubber lens hood). I would love the 7-14mm too but the price is bit rich for my budget! Wow. That’s some filter holder.